Some concepts make production. Many don't. This one might. The all-new Acura NSX is a pretty big deal for the automaker. Along with the road going version there’s also the previously revealed GT3 racer which ditched the former’s all-wheel drive and hybrid systems. And no, a production version of the GT3 won’t go on sale. Today, Acura has revealed yet another racing variant NSX, only it’s all electric. Meet the NSX-inspired EV Concept which will compete in the Electric Modified Cars Class at the 2016 Pikes Peak International Hill Climb. Unlike the NSX GT3, this car retains the AWD system which features technology that enables four-wheel independent torque allocation. Last year at Pikes Peak, Honda/Acura campaigned an electrified CR-Z-based prototype and, compared to that, this year’s car produces three times the total system output. Honda has actually been developing its AWD tech for the past 20 years and in this application it features high-output electric motors and 4-motor torque vectoring, factors that’ll make this concept very well-suited to Pikes Peak’s 156 challenging corners. But could this EV technology find its way one day to a production-spec all-electric NSX? Judging by how fast EV tech is progressing, we wouldn’t be surprised to see Honda/Acura green light such a car. It’s been a long time coming, but the Acura NSX is a thoroughly impressive supercar that was well worth the wait. 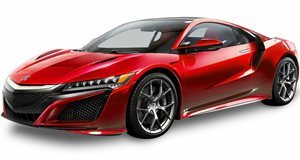 The new NSX's biggest crime is not being the old NSX. It's time to shut up about that.